With the current level of maturity and saturation of mobile app stores, for a while it felt like the time of app mega hits was gone. But it turned out that’s not the case and the augmented-reality mobile game Pokémon GO, developed by Niantic, Inc, is here to prove we were wrong! Augmented Reality technology brings up many applications on the table, as with mobile apps in general, Games category has been leading the pack and Pokémon GO was the first up to hit the ground really hard. After its phenomenal success the game became a yard stick for other Augmented Reality-based games to measure their success. Before you will dive into the statistics, if you want to download Pokémon GO, here it is for your iPhone or Android smartphone. The game was launched on July 6th in North America, Australia and New Zealand and within days it became phenomenally popular and demonstrated an astounding potential for growth. Pokémon GO has broken all previous records of popularity of any mobile game or app for that matter on both Apple’s App Store and Google Play market. Further on we’re going to digest Pokémon GO performance via several avenues – statistics about how the game performance on the market, stats about people who’re playing the game and how much revenue does Pokémon GO team manages to reap since the game’s launch. If you need to get a quick picture of what is Pokémon GO today, the following bullet points will do exactly that for you. To appreciate the scope of the phenomena, let’s walk through all facets of the Pokémon GO current performance. A mobile app usage stats consists of several components – a number of installs an app generates, number of people that use the app regularly on both monthly and daily basis and its retention rate. The first metric to look at is the number of downloads the game has been getting since its launch. The first day about 6 million copies of Pokémon GO were downloaded in US, New Zealand and Australia, with this ground-breaking number of downloads Niantic had to pause the game’s release in other countries due to server overload. In present only the data for July 7 – 20 is publicly available but even this limited data poll reveals a pattern – the game had its downloads peak within first 6 days and than it began to decline. Down the road, with the continuous rollout in other countries, the number of daily downloads may go up. When we compare the number of people who play Pokémon GO daily (DAU) with previous mobile game and app hits in general, we see that the game has managed to beat the previous record of Candy Crush, which enjoyed slightly less than 20 million DAU but Pokémon GO already has more than 20 and with continuous roll out world wide most likely this number will increase. One of the biggest challenges mobile app owners have today is to break into this set of 3-5 apps people use the most daily. Among Android users we see Pokémon GO has managed to gain 6%, which is unheard of for a game to become the next most used app after Facebook’s Messenger, Instagram, WhatsApp and Snapchat. Another metric that is so important for mobile app developers and that plays a crucial role in a long run is retention. Retention defines how many days app users continue to use an app, within first 3, 7 and 30 days. More than 60% of Pokémon GO players continue to play the game within 3 days since they download the game. An average app industry figure for a 3 day retention is about 15%. In the US alone more than 34 million people have downloaded the game since its launch on July 6th and now, a month after, 90% of these people are still playing the game. 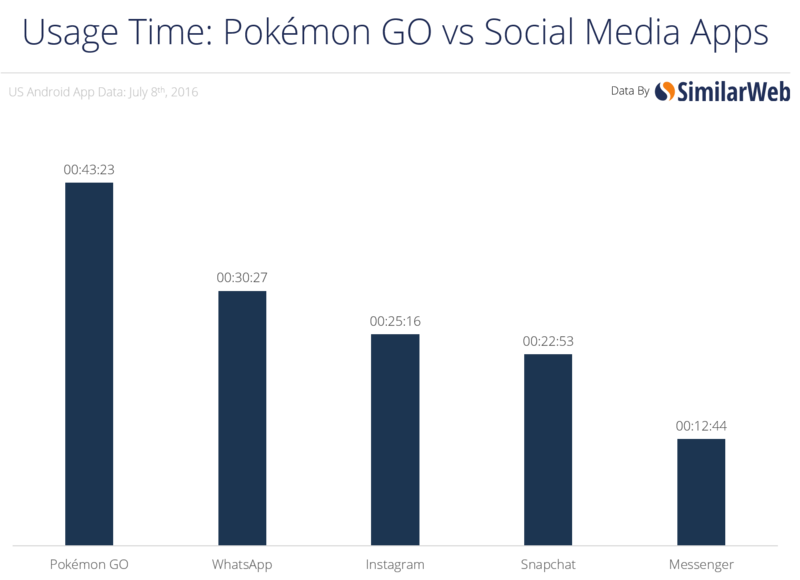 In the US alone smartphone users spend more than 3 hours a day on mobile apps and in this context 43 minutes Pokémon GO players spend on the game daily look pretty impressive. It’s actually more than people spend on pr WhatsApp, which is only around 30 minutes, Instagram and Snapchat that get around 20-25 minutes of people’s time daily and Facebook Messenger that gets only about 13 minutes. Of course having that immense number of downloads, Pokémon GO game has managed to conquer both US App Store Overall and Games Top chart and it continues to hold this position at the moment. There were only a couple brief moments when the game held second and third position since its release on July 6th of this year. Every mobile game user base has a different proportion of generations of people who play it. With Pokémon GO we see Millennials among early adopters of the game, on its launch they contributed 55% of the total user base and by the end of July their number declined to 45%. On the other side of the spectrum are Silents generation, which due to senior age and overall less active lifestyle, aren’t into the game and they consistently contribute only 5% of the total game’s user base. As of the end of July, Pokémon GO user base gender split revealed a 40/60 split between women and men. Does it mean men have more spare time to kill on the game than women do? If we look at the world map with countries where Pokémon GO is available, we see that currently only most part of Eurasia and Africa aren’t affected by the Pokémon GO phenomena. Within a month period, the game became available in 56 countries. Certainly when the Niantic team was releasing Pokémon Go, they weren’t motivated by the idea to create a cultural phenomena but to launch a successful project and make a profit on it. A Gym (Japanese: ジム Gym) is a place where Pokémon Trainers go to train their Pokémon. Number of Pokémon GO Gyms (locations to play for multiple people simultaneously) in Japan’s McDonalds has reached 3,000. To find Pokémon GO Gym nearby you can use Pokémon GO Gym Locator. By having millions of downloads on a daily basis, Pokémon GO has managed to conquer both US App Store Overall and Games chart and it took only 13 hours to get to the top. It remains the leading position to this day, with only a couple brief periods when it went down on the second and third position. As it usually happens with any hugely popular app, a game especially, people give it a mix welcome. On the iTunes App Store all versions of the game have on average 3 stars and the latest version has managed to gained 3.5 stars. It goes to show that there is a room for the game to be improved to deliver experience people expect to have with playing Pokémon GO. But also we should point out that when it comes to games, they naturally invoke the most intense reaction, it’s really hard to please all players, some of them will continue to be frustrated no matter what improvements for a game its developer will deploy. Google Play market ratings for the game are on par with the iTunes App Store and currently it has 3.2 stars. And just like with the iTunes ratings, they are polarized, the game has the greatest number of 5 and 1 star reviews, meaning people either love Pokémon GO really much or hate it for some reason. As of August 12th, 2017, according to the SensorTower mobile app ecosystem data and insights company, Pokémon GO has generated $258 million in total. This profit was gained mostly from several different in-app purchases the game has for users to collect PokéCoins. This number doesn’t include a profit generated from the deal with fast food chain McDonald’s that was leaked on July 20. One of the most important constituents to a mobile app success on a market is how much revenue is being generated per its daily active user (DAU). Pokémon GO beats both Candy Crush Saga and an average number of casual games in general, with $0.25 per daily active user against $0.22 for Candy Crush Saga and $0.10 for casual games. On iOS devices as much as 80% of iOS players do in-app purchases and it’s projected to bring Apple Inc. more than $3 billion within the next two years. About 10 million Pokémon Go users in the US, which is 29% of all players, made in-app purchases. Of these, about 6 million players have spent up to $20 and another 3 million players have spent between $20 and $60 on in-app purchases. And finally, the most lucrative portion of the user base, about 5% of all Pokémon GO players (480,000 players) have spent more than $100 on in-app purchases. Thanks for Pokémon GO the Nintendo stock jumped $9 billion. Pokémon GO is the latest proof of concept that if you combine a mobile game with innovative technology, like Augmented Reality, and add a partnership with such mobile ecosystem behemoth as Google, mostly likely you will hit a jackpot and create not just a new mobile game but a worldwide phenomena. And of course, there is one extra component of the Pokémon GO success – it’s based on previously popular Pokémon brand. We hope it’s one of many more augmented-reality based games that will be realized and will bring a new twist to the established mobile game market.